Denver news site co-founder Kevin Ryan chats with Yahoo Finance's Andy Serwer. 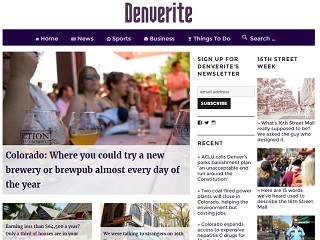 Launched in June, local news website Denverite at the end of the summer is a robust operation with a robust staff. Still no ads, though. But that was the plan: to wait until at least half a year before integrating advertising. Denverite co-founder Kevin Ryan, who is partnered with Wall Street Journal alums Gordon Crovitz and Jim Friedlich, sat down this week in New York with Yahoo Finance’s Andy Serwer to chat about this latest enterprise. Ryan’s serial resume encompasses Business Insider, Gilt Groupe and DoubleClick. In the shadow of Jim Brady’s Philadelphia news portal Billy Penn and forthcoming second Spirited Media effort, Pittsburgh-focused site The Incline, it’s intriguing to listen to Ryan discuss his own expansion plans. He told Sewer that he and his partners are eyeing for 2017 cities that, in terms of population, lie beyond the big three of New York, Los Angeles and Chicago. Denver is the 19th largest city in the U.S., and Ryan indicated his group is interested in other cities ranking in the top two dozen. Watch the full video conversation here.